Amazon has been making a lot of noise since Apple announced the iPad mini. Fundamentally, they are trying get in as many sales as they can before Apple’s 8-inch tablet officially goes on sale on Friday, November 2. However, the judicious application of skepticism and a red pen shows the Kindle Fire HD vs iPad mini comparison is actually lopsided, but not in the way shopzilla makes it seem. 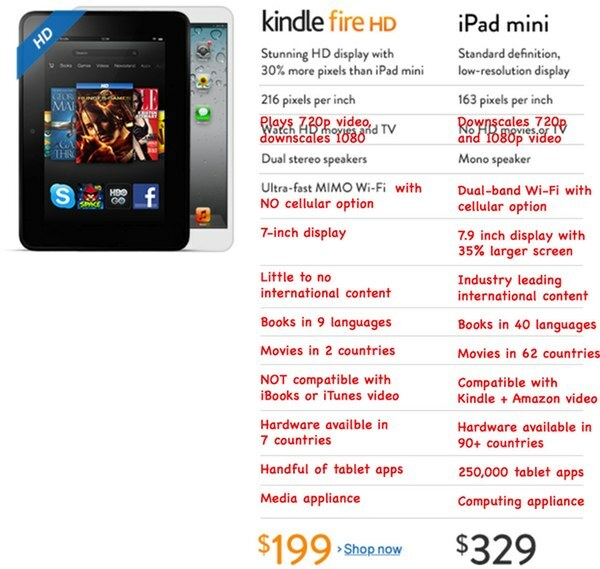 The above edited version of Amazon’s Kindle Fire HD vs iPad mini comparison comes courtesy of the good folks at iMore. As you can see, Apple’s smaller tablet, which has a lot more screen real estate than Amazon’s, is far from deficient. That said, the only addition to iMore’s edit that I can think to add is the fact that the Kindle Fire HD’s “dual stereo speakers,” according to scores of professional and user reviews, sound quite awful. Go to Best Buy, or wherever fine electronics are sold near you, and hear for yourself. For what it’s worth, neither Kindle nor iPad fans should get their knickers in a twist over any of this. Fundamentally, these are two entirely different products designed for very different types of users.